Nestled in the foothills of the San Gabriel Mountains, Descanso Gardens is a botanical garden of year-round natural beauty, with internationally renowned botanical collections and spectacular seasonal horticultural displays. Descanso Gardens is accredited by the American Association of Museums as a museum of living collections. Through rich and varied programming – horticulture classes, family-friendly festivals and concerts, and lifestyle and fitness courses – we invite the public to experience nature in its diversity and enjoy wide-ranging learning opportunities. Significant landscape features other than the Camellia garden include the rose garden, California native plant garden, Japanese-style garden and seasonal displays, featuring cherry trees, warm-season lilacs and spring bulbs, all set in a pre-existing Southern California oak woodland. The garden surrounded by a natural buffer zone of 80 acres of California chaparral and coastal sage scrub. The Camellia Garden is the oldest introduced collection at Descanso and has its roots in the camellia plantation established by E. Manchester Boddy in the 1930s. A Los Angeles newspaper owner and entrepreneur, Boddy established the plantation as a commercial venture in 1937 to provide flowers and foliage for the floral trade. When people of Japanese heritage were forced into internment camps during World War II, Boddy purchased 60,000 camellia plants from two Japanese-owned nurseries in the San Gabriel Valley. These plants, mostly japonicas, were the foundation of today’s collection. The most famous addition arrived in 1948 with the importation of 20 cultivars and hybrids of Camellia reticulata from the Kunming Institute of Botany. 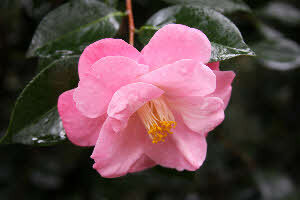 Camellia enthusiast Charles Hester expanded the collection with donations in the 1960s. Since 1997, significant additions have included Camellia species, Camellia reticulata cultivars, award-winning miniatures, Camellia saluenensis hybrids, fragrant camellias and yellow camellia hybrids. 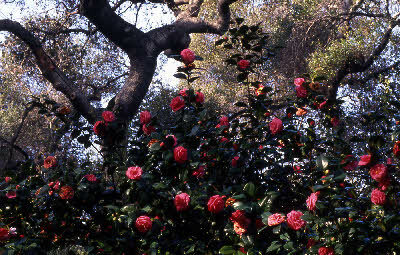 The Camellias are planted under a canopy of mature coast live oak trees (Quercus agrifolia) and cover approximately 19 acres.